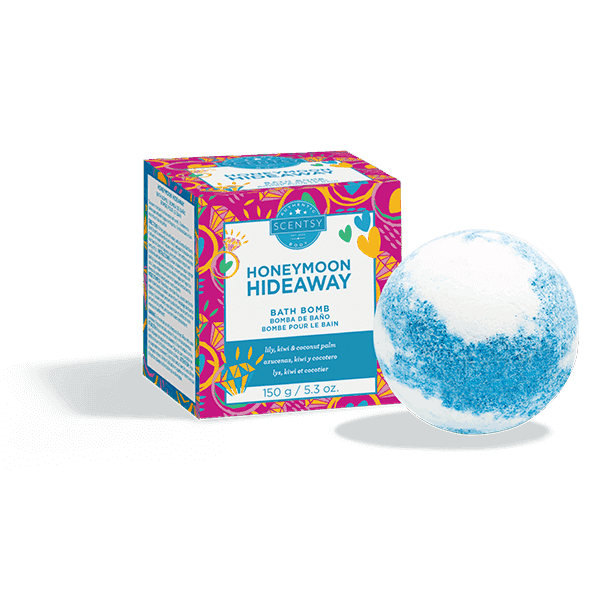 Scentsy Honeymoon Hideaway Bath Bomb – Honeymoon Hideaway Bath Bomb – Escape to a secluded retreat of dew-kissed lily and tart-sweet kiwi, shaded by lush coconut palm. Honeymoon Hideaway Bath Bomb – Escape to a secluded retreat of dew-kissed lily and tart-sweet kiwi, shaded by lush coconut palm. An exhilarating fusion of inspired fragrance, skin-pampering moisturizers, vivid color and lots of fizz.